A new build in Washington state is this week's Living Large In Small Spaces feature. 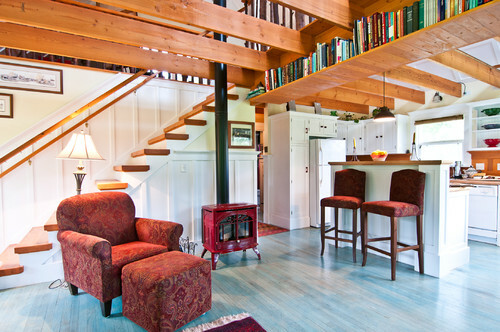 For all my color-loving cottage friends, this 1,000 sq ft home should make your heart happy. Built by family members -- one of them a local builder -- this vibrant home began life as a guest house. Now it's a full-time residence. 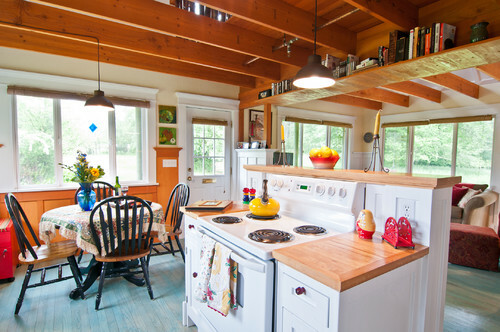 To maximize space, the cottage utilizes an open floor plan. The wood floors were salvaged from a house torn down in 1999. A water-based stain was applied to reveal the wood's grain, and rubbed for a weathered look. Board and batten, a sweet red heating stove, and open beams add even more character to the one-bedroom, one-bath cottage. Surprisingly, the gorgeous stair treads are made from a pressure-treated lumber that was badly warped and twisted. The builder ran the boards through a planer and shimmed them to get uniform thickness. 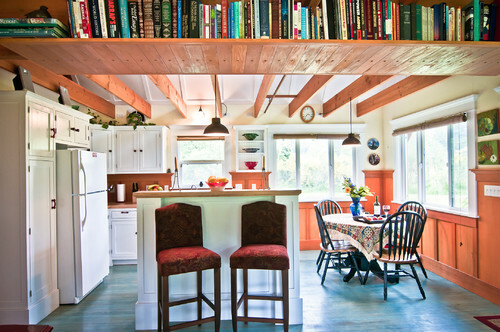 Boards were screwed into the beams to create space-saving bookshelves. 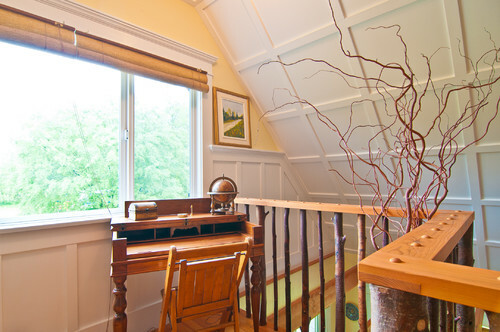 Natural light is plentiful throughout the cottage thanks to large windows. 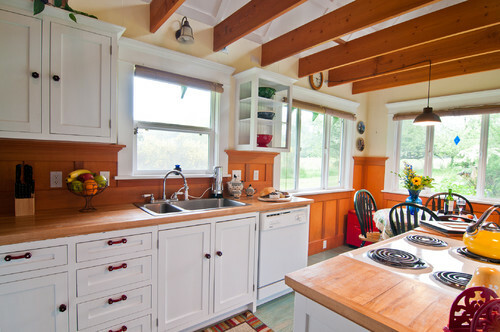 The kitchen is a study in the use of salvaged material to create a beautiful space: cabinets were salvaged from a nearby remodel -- the frames rebuilt and painted; doors and drawers were treated to new hardware; the wood paneling was built from plywood and trim fabricated onsite. The wood countertops were built using miter joints and herringbone detailing at the corners. This detail really kicks them up a notch. 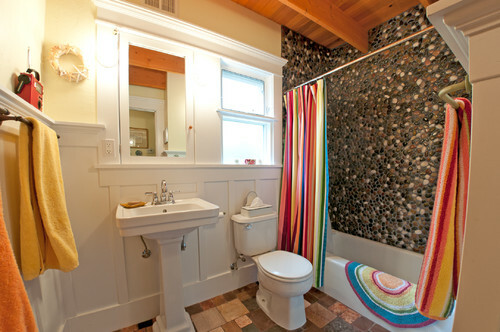 A combination of salvaged and donated rock was used for the bathroom tile floor. Semi-polished stone placed by hand surrounds the shower. The window was salvaged from a friend, the toilet was free, and the medicine cabinet was crafted by the builder. The bedroom is delightful. I love the green painted furniture, and of course the board and batten. Oh, and the ceiling. . .the floor. . .pretty much everything is this bedroom speaks to me. 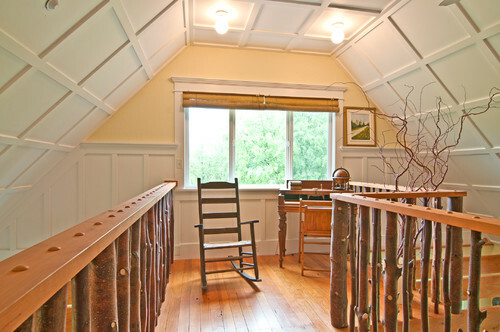 The intriguing banisters in the loft were created from tree limbs cut back by the power company when they placed a power line easement along the property. Just look at the board and batten ceiling. Stunning. A12-to-12 roof pitch provided some additional room for loft space. Careful planning initially with adequate ceiling joists allows for the addition of a full second floor in the future, should the owners decide they want it. Everything about this charming cottage shows attention to detail. 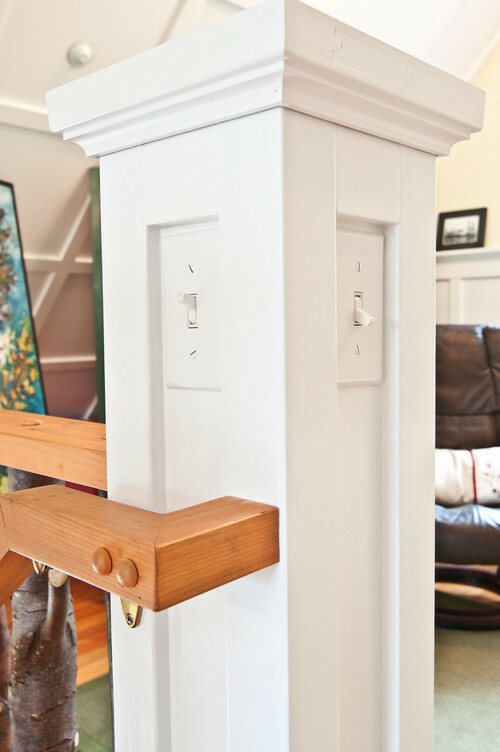 In the loft, light switches were cleverly placed in the newel post's open spaces. 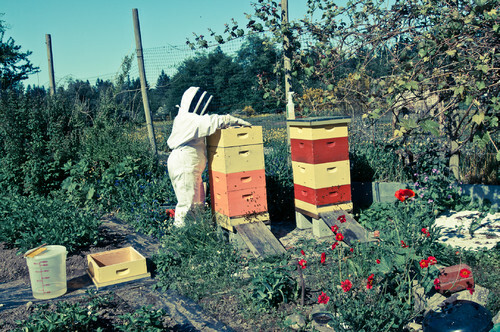 Outdoors there's room for growing fruits and vegetables, and raising bees and chickens. 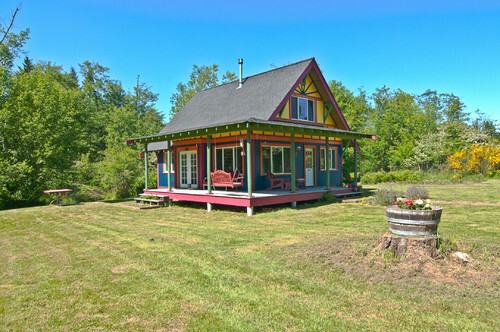 What's your favorite feature of this crayola cottage? 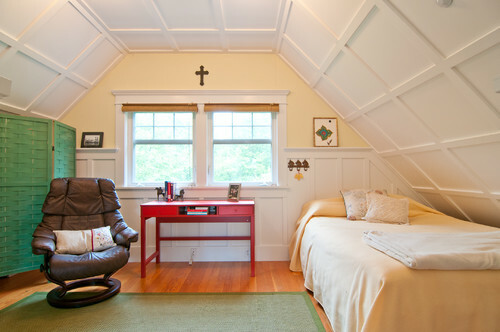 You can read more about this cottage in the Houzz article here. Hi Nancy, Well, I love uniqueness and my favorite was the tree limb banister. No fluff... just simplicity with eye-candy, colors placed here and there. I love the windows! In the PNW, you need lots of light. Love the bookcase area . . .
Wouldn't one of those movable ladders be cool . . . 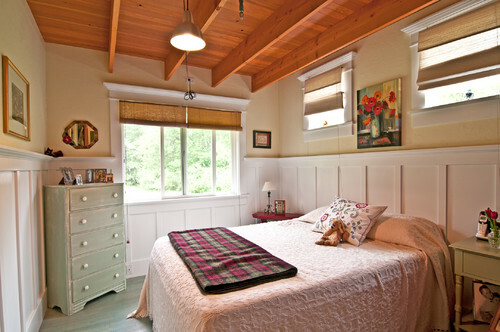 I found the bedroom charming, the board and batten certainly gave me a cottagy feel. reusing old to make new I really liked too. Little red cast iron wood burning stove was an added touch . . . I would accept the keys in a flash! I love the simplicity and open plan of this sweet charmer! The LIGHT is able to dance about and make it airy and comfortable while maintaining a cozy feel. What a clever design and brilliant team of builders to make it all work! Oh Nancy, we just found a wonderful British show on Netflix but I can't remember the name; each episode with the hosts, a couple or a person who is in search of buying a home is taken to three properties. The English countryside and the cottages and villages have captured our hearts. I thought of YOU! Addictive is right! I'm getting nothing done! I love the color!! And the beams and board and battan.....pretty much everything! Love this one Nancy. I think it is awesome that they used the tree limbs for the stair rails. Very clever and fun. Love the book shelves too. What a fun cottage to live in. I love all of the light filled rooms, nothing depressing about this house! How lovely, it's so cheerful and bright, I love everything about it! And I am so happy I found your blog, I'm adding you to my blogroll on my page so I can keep up with your posts! Nice to meet you, Debbie. Thanks for stopping by. What cheerful location and rooms, thank you for sharing another so lovely home with us, darling Nancy, I absolutely love this series of yours ! That wood is just beautiful!! I love the beams, the stair balusters, the floors...gorgeous all around. 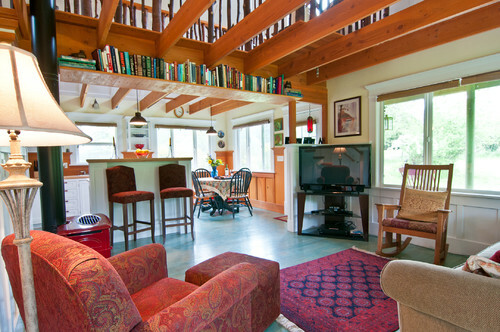 I love everything in this cottage. The use of wood, the panneling, the windows... A great job! I like all the natural light.....lovely. I also like how creative they were....they must have had fun with this one. I'm back online - and catching up - after being on an adventure for the past almost two months! I don't know what I like best in this darling cottage - it's all wonderful. I do love the living area and the details in each part. Will be checking in with more of your posts until I'm all caught up again!